To show appreciation for her improving health when she moved to Santa Barbara, artist Kat Martin began volunteering for Hospice of Santa Barbara. Joie de Vivre, a solo art exhibition by Kat Martin, local artist and Hospice of Santa Barbara volunteer, will be on display Feb. 9-May 12 at the Leigh Block Gallery at Hospice of Santa Barbara, 2050 Alameda Padre Serra, Suite #100. 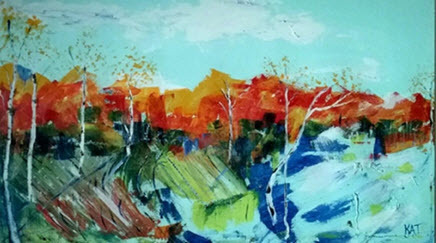 Martin’s art provides an artistic reflection of a life suffused with nature, what she has deemed as her own “visual journal.” Martin attended high school in Waterville, Maine, and fell in love with the landscape, people and way of life during her 35 years in the state. Two years ago, Martin and her husband moved to Santa Barbara with the hope that a warmer climate would ease her personal health issues. Shortly after the move, her health began to recover and her gratitude led her to volunteer for HSB. Along with improving her health, Santa Barbara has influenced Martin’s art. Her palette knife paint strokes became broader and full of joy. Martin’s work has been featured at Mind, Body and Spirit Studio in Maine, Musewood Arts in New Hampshire and locally at Art From Scrap. She holds a B.A. in installation art/art as a forum for community voice and vision from Goodard College in Plainfield, VT.
Hospice of Santa Barbara will host a wine and hors d’oeuvres open-house reception for Martin’s exhibit from 6-7:30 p.m., Thursday, Feb. 9. Martin will donate 25 percent of the proceeds from her art sales to Hospice of Santa Barbara, Inc., a volunteer hospice organization. To schedule a viewing of the exhibit, call 563-8820. — Ryan Mandell for Hospice of Santa Barbara.